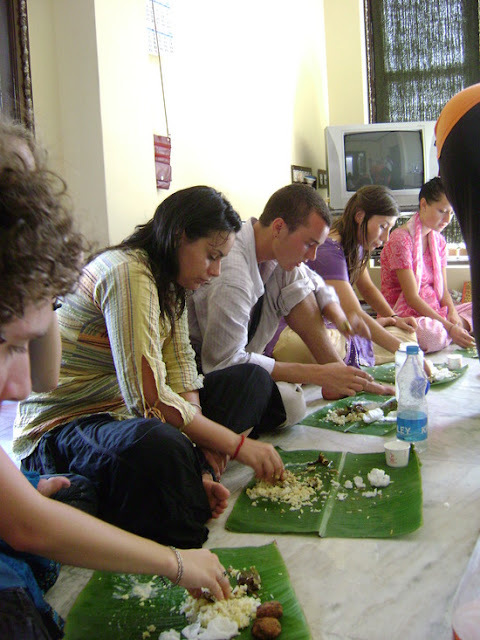 A majority of Indians like the traditional way of eating food / meals i.e.sitting on the floor and eating food with fingers / hands. This may sound unclean / unhygienic for non-Indians but for Indians there is some in-depth meaning in this traditional way of eating. 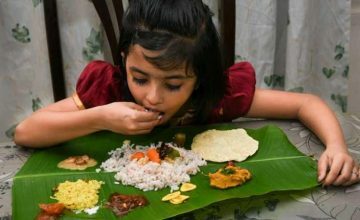 In the ancient times Indians might have had a thorough knowledge on the advantages of this ancient Indian way of eating food and there could be some rationale behind it. Let's study. A healthy ancient Indian practice of eating food is having food sitting on the floor and not on dining table. Food is served in eco-friendly plantain leaves placed on the floor. In Hinduism, food is considered sacred and is considered as Goddess Annapoorna Devi who is believed to have served food to Lord Vishwanath (i.e Lord Shiva) of Kasi (the present Varanasi in Uttar Pradesh). Shoes and socks or sandals must be removed while sitting on the floor for having meals which is a typical Indian style of eating food. By doing so, the spread of germs / pollutants which otherwise might have accumulated on your shoes / socks, is restricted. 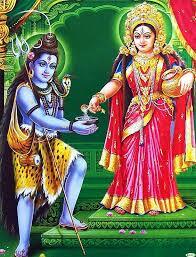 Sitting on the floor and eating food is a mark of respect to Annapoorna Devi - the Hindu goddess of food. It signifies humbleness and devotion to the goddess. Scientifically, human beings who are living beings cannot survive without food. So, Indians respect the food they get to eat for the day. When a traditional meal is served on plantain leaf, one has to wait till all the items are served. Picking up of items while these are being served and putting in mouth is not a good manner. Secondly, when there are elders sitting in the row, one is supposed to wait for the elders to start eating food. This is a gesture of respecting the elders. Similarly after a person finishes eating, he / she is not supposed to get up and go for hand wash but he / she has to wait till the elders i.e the older ones finish eating. The young ones have to get only after the elders get up and go for their hand wash.
Another good gesture while having meal is not to leave any food in the leaf. Food which is grown by the farmers, should not be wasted. So, initially all the items are served in very little quantity in the leaf to avoid wastage. Serving all the items shows what all items are prepared for the meal. During the second round of serving food, people ask the items of their like and politely reject the items which they don't like. By doing so, there is no wastage of food. Leaving food items (half eaten or not eating at all) in the leaf is not a good manner. But it is treated as a sign of disrespecting food. An ancient eating habit of Indians is eating food with fingers / hands. Basically Indians are rice eaters, particularly South Indians while in the North people mostly eat Indian breads i.e chapati made of wheat. Food is served hot and also relished hot. So, one of the advantages of eating with fingers is that when you initially touch the food with hands, you can easily make out whether the hot food is bearable or not. This avoids burning your mouth / tongue. The very sight of food and its touch triggers the secretion of digestive juices and the digestive system gets ready for its proper functioning. Indian foods are enjoyed the most when you eat with hands / fingers. It gives you a satisfied feeling. So also, licking of fingers after a sumptuous meal is a sign of satisfaction and it indicates how much you relished the food. But lifting up the plate / bowl and licking it is not considered a bad sign. In Hindu religion, it is inappropriate to eat food with left hand as this is used for the other purpose i.e. cleaning the private parts. A majority of Indians follow the age old practice of using water for cleaning the private parts after defecation. Indians are not much used to the use of toilet tissues. Hence, use of left hand is restricted for the purpose and is not used for other good activities. Basically, Indians use their right hand for touching food, serving food and for eating. However, when you eat and simultaneously serve food, then you are not supposed to touch the food to be served, with your right hand as you are still eating with the hand. However, washing hands before taking meals is a must from hygienic point of view. The age old practice of disposal of leftovers is done in an eco-friendly manner. The plantain leaves along with the leftover foods, if any are rolled up and disposed in the backyard. This serves as a food to many animals / living creatures. Animals feed on the disposed items. If it not fed by the animals, it mixes up with the soil and replenishes the soil with nutrients. After this flash of thought, I thanked the Westerners (of course in my thoughts) who gave me the opportunity to get to know more about the traditional way of eating food. However, India being a vast country with varied culture, the way of eating style differs from region to region. Photo Courtesy: All the above pictures are taken from Google Images.